CFS Ships FAST & FREE! FREE SHIPPING on all orders of $50 or more to the 48 contiguous U.S. states! We cannot ship outside the USA. Most orders placed before 4:00 p.m. Eastern Standard Time (East Coast) will often SHIP SAME or NEXT BUSINESS DAY. Larger binding machines that ship via Common Carrier may require additional time to ship. 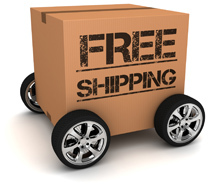 Our FREE shipping applies to all new, stock items on this website, when your order totals $50 or more and shipping to the 48 contiguous U.S. states. Delivery is via standard FedEx Ground, UPS Ground service or, for larger/heavier items, standard common carrier/motor freight service – carrier to be chosen at CFS’ discretion. Free standard shipping is not available for orders shipping to Alaska or Hawaii. Some larger used items may incur freight or delivery charges. A minimum order fee/shipping charge of $15.00 is applied to all orders under $50.00 and is shown on the billing portion of the checkout process. This charge is the result of minimum order/handling fees from many of our suppliers/manufacturers that drop ship items direct to the customer. For complete details, visit our full Shipping Information. CFS utilizes multiple warehouse across the United States. Most binding supplies (coils, combs, covers, screw posts, etc.) ship from our warehouses in New Jersey or California, depending on stock and availability. Most staples, padding supplies and passport photo items ship from our central warehouse in Michigan. See our Shipping Locations for full details. If you would like to confirm which warehouse will be utilized for your order, please contact us directly to confirm stock and availability. Expedited shipping is available at checkout… see our full Shipping Information.